The engineers at Deltran led the way in innovation and convenience by introducing the International Battery Tender? Waterproof 800. Since its introduction in 2003, it has been widely accepted as a solid new addition to the Battery Tender? family of charger products. This compact 800 mA battery charger has all the charge characteristics of its cousin the Battery Tender Junior. It incorporates highly efficient surface mount technology electronic components. The interior is completely encapsulated, protected from shock, vibration, and moisture by an electrically insulating, thermally conductive, flame retardant, UL recognized, synthetic epoxy resin compound. It's tough, affordable, and a strong, innovative battery charging solution. 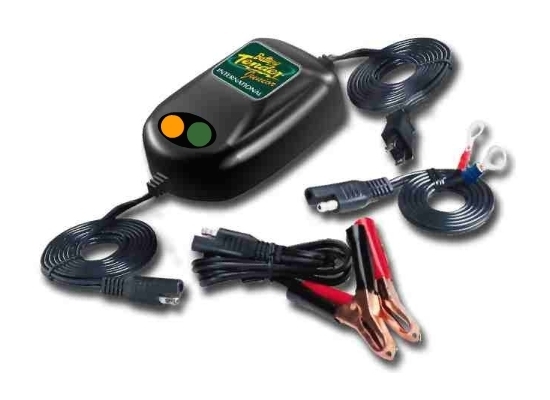 This charger is no larger than a standard computer mouse yet packs 800 millamps of pure constant current charging power. Coupled with a brain (IC chip), the charger will constantly monitor, charge, and then maintain your battery --- even while totally submersed under water! Perfect for all outdoor types of ATV's, watercraft, motorcycles, boats, or anywhere water is a threat. International universal input voltage works anywhere in the world 100-240 AC Volts 50/60 Hz.